In keeping with the nature of Pixar releases, short film followed by main feature, it seems only fair to review them in kind, so here we go. Presto is a magician who uses a rabbit named Alec (surname, Azam) in his act in conjunction with a pair of special hats. When he doesn't feed Alec, Alec gets involved in a brawl with his master and utilises the specialness of the hats to inflict numerous inventive acts of pain upon him. Absolutely charming and hilarious, it's a fantastic curtain-opener for anyone with a funny bone. The set-up seems limited and I personally wasn't sure how well it would sustain a short film but the ways in which Alec uses the hat are consistently inventive and had me laughing out loud from pretty much the very beginning. It recalls the best of short cartoons of yesteryear, I was particularly put in mind of Tom and Jerry in its focus on a small, cute character visiting pain upon a larger character, and it's interesting to see a film released under the Disney banner which has such a WB sense of anarchic fun. Pixar have always delivered great short films before their feature length ones and, even if it's not quite as good as Geri's Game, their peak, in my opinion, it's still fantastic. Gets the audience in just the right mood for the main event. Earth, 900 years in the future. Humanity has abandoned its homeland due to pollution and the accumulation of waste, leaving behind robots to clean up the mess, all but one of which have since stopped working. Amongst the abandoned skyscrapers and those built entirely of cubes of trash, trundles the last robot on Earth; WALL-E, (Waste Allocation Load Lifter: Earth-Class) who spends his days compacting trash, collecting items that interest him, watching Hello Dolly!, and playing with his only friend, a cockroach. His simple existence is disturbed, however, by the arrival of Eve (or iEve as I have come to think of her), then things get really interesting. First things first, I love Pixar. I think they are far and away the best American animation studio currently going and each of their films has been a delight for me to behold, with the notable exception of Cars, which I didn't take to at all. I eagerly awaited the release of their latest, from the teaser trailer released before Ratatouille last year up until the first real glimpses of the film and its title character started to appear a few months ago, and the more I heard about it, the more I liked the sound of it. It would not be incorrect to say that I was excited about seeing it and, I'm pleased to say, it met and exceeded my expectations. As ever, Pixar really push the boat out in terms of animation, with WALL-E being their most stunning to date. The early part of the film, taking place on a desolate Earth, is utterly beautiful in its grotesqueness, with so much attention to detail and a near photo-realistic quality, it's really quite astounding seeing how far computer animation has come in such a relatively short time. This also extends to Andrew Stanton's direction, which makes full use of techniques, particularly lighting and camera moves, that are par the course in live action but it's really refreshing to see used to such great effect in an animated film. This excellence continues once WALL-E and Eve leave Earth, as we are treated to a vision of a futuristic cruise liner, the last refuge of humanity, which is absolutely breathtaking in its scope. It's a feast of neon and a tremendous image of a future society in which humans have devolved into little more than blobs whose every whim is catered to by a specific robot. It's this last aspect that I found particularly interesting, as it's a reflection of the darkness that lies at the heart of a film which, on the surface, with its big-eyed hero and easily imitable computer sounds that represent about 80% of the film's ''dialogue'', would seem to be very light fare, but is in fact one of the darkest films to be released under the Disney banner since Pinocchio. It's a film that paints a very grim picture of humanity's future, one of complete decay and decline in which not only our planet but ourselves have changed in such a way that is far removed from our own reality bit not so much that it is outside the realms of possibility. It's a wonderfully realised science fiction future, a surprisingly dark one, and there are also satirical swipes at consumerism and corporations. It's to the credit of the team behind the film that it's message is not preachy or forced down your throat because they never let it get in the way of the story, which, at its heart, is a simple love story, and a surprisingly touching one at that. 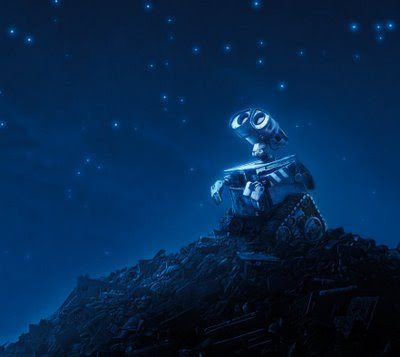 And, for all its darkness, WALL-E is a really fun film. The slapstick is of a Chaplin or Keaton quality, in that it's as laden with pathos as it is with humour, particularly as WALL-E tries to woo Eve; there's plenty of adventure and action in the second half of the film; and it never loses sight of its need to entertain. Much of this is down to the score and the use of existing music, which serves as an additional narrative thread to the film beyond the images. The score itself is beautiful but intensely haunting, with the opening theme that players over the title of the film perfectly complementing the images of WALL-E's lonely existence, with notes that are as desolate as the cityscape which he inhabits. Several songs from the 1969 film version of Hello Dolly! are also used frequently as WALL-E is obsessed with a copy of the film and one particular song serves as the 'Love theme' between WALL-E and Eve, the repetition of which helps to heighten the emotional connection between the audience and these two inanimate, computerised objects. There are perhaps a few flaws with the film, most notably the switch from the dialogue-free first half to the second half, where the human characters are introduced. It's more a reflection of how accustomed the film had made me to the characters communicating solely through bleeps than an actual decrease in quality, but it is quite shocking to go from relative silence to human characters interacting with the robotic ones. On my second viewing (I went to see it less than a week after the first time), this was much less jarring as I was expecting it, and it really is a minor quibble that I'm struggling to point out amidst the near-perfection of the rest of the film. And, before I forget, the credits are brilliant. I know that's a strange thing to say when reviewing a film, but they really are special. A simple idea that continues the story after the film has properly ended and which is as sweet, clever and funny as the film that preceded it.